Remember to set fantasy lineups on off-chance that I can move into first place before the flood. Watch Bay Area series, Subway series, and Mavericks vs Thunder, so that I will be able to give all the folks in heaven an up to the minute sports update. Forgive that flute player for dragging me out to Davenport, Iowa in 1993 for one gig, driving all night non-stop from New York City, and docking my pay $25.00 for oversleeping and being ten minutes late to the soundcheck. When people ask me who my favorite musician is, or what my favorite song is, I find it impossible to come up with an answer. There are too many to narrow it down to one. Besides, if I did have a favorite song I would probably overplay it to the point that it would lose its number one ranking. I do have my list of favorite pianists — Bud Powell, Horace Silver, and Wynton Kelly — and if you put a gun to my head I would choose Bud Powell, but regardless, it doesn’t feel right to narrow such genius down to one person. When it comes to my favorite record I’m going to make an exception. 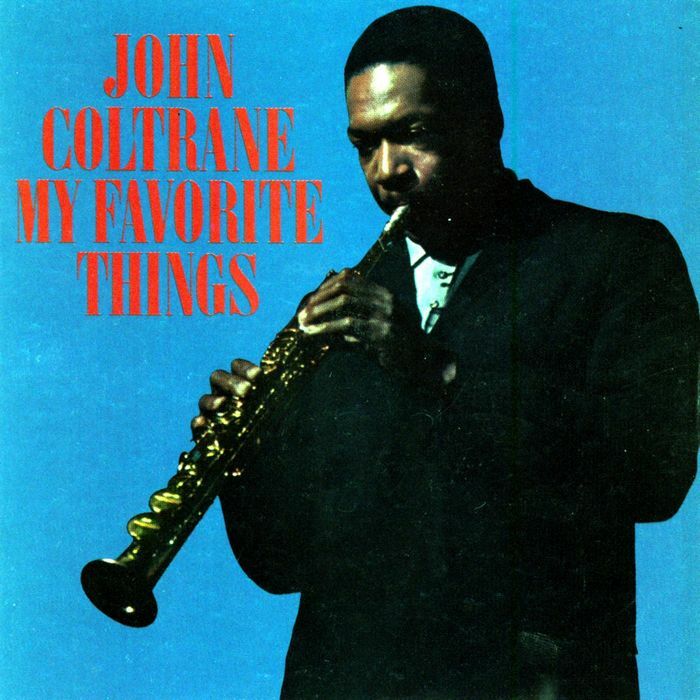 Coltrane was 34 years old when he recorded My Favorite Things on October 24th, 1960, 2 weeks shy of JFK winning the presidency and one month after the Pittsburgh Pirates, behind Bill Mazeroski’s dramatic 9th inning homerun, defeated the New York Yankees in game 7 of the World Series. I was one day shy of two months old. During the previous three years Coltrane had worked with Theloniuos Monk and Miles Davis respectively. During this period he played long, note-laden solos that critic Ira Gitler dubbed “sheets of sound.” Between Monk’s angular compositions, and later with his own Giants Steps chord changes, Trane was playing over some of the most intricate, sophisticated harmony ever conceived, and he worked his way through these thorny chord changes like a knife slicing through butter. By the time of My Favorite Things we see Coltrane straddling his sheets of sound with a more muscular, modally infused lyricism that would inform his classic quartet of the early to mid 60s. The record is composed of four standards, but the arrangements are so germane to Coltrane that they may as well have been original compositions. They are disparate songs which are not only connected by Trane’s genius, but by the group’s sound. Coltrane’s concept meshed perfectly with his new group. McCoy Tyner Steve Davis, (Jimmy Garrison would not join him for another year) and Elvin Jones infused Coltrane’s earthy relentless tone and hard-driving rhythmic concept with an ideal underpinning, giving him the freedom to expand on his ideas. You can almost sense that he is so comfortable with his band that he has the confidence to play less. These musicians were the ideal compliment for him, widening the beat and fusing dissonance, lyricism, and explosive poly-rhythms. Tyner’s 8 bar introduction to Richard Roger’s My Favorite Things is at once dark and foreboding. Coltrane suspends the song’s chords over an E pedal and alternates between major and minor vamps. The combination of his soprano sax and Davis’s droning E pedal gives the song an exotic, Eastern flavor. If anyone thinks that it is a simple feat to play over one or two chords for this long a period I would advise them to try this at home and see what happens. Not only does Trane never run out of ideas, but he shows such an attention to melody and phrasing that we never want him to stop. The ballad, Everytime We Say Goodbye, perfectly offsets the denseness of the songs that frame it. It could serve as a treatise on how to play a melody. It is romanticism at its finest. It is side two, however, which for me makes this date. It is comprised of two devastating arrangements of a pair of Gershwin songs that are both shocking and awe-inspiring. They are cast against type and perfectly fit the scope of Trane’s style and they seamlessly cohere to the shape of this date. Coltrane transforms Summertime from a languid, bluesy number to a tour de force modal vehicle, complete with pedal point, whole tone harmony, and a four bar break that rivals Bird’s all-timer on Night In Tunisia. The album’s closer, But Not For Me, is Trane’s farewell to Giant Steps changes and it transforms a well-worn vehicle into a personal tour de force. He uses the Giant Steps progression on the first 8 measures of the A and B sections, but it is the long tag — the iii-Vi-ii-V turn-around vamp at the end of his solo and final melody chorus — that stands out. Here is an artist with an inexhaustible wealth of ideas that is able to build tension and excitement over the same four chords for several minutes at a time. Only Sonny Stitt could play a tag for this long without running out of ideas, but Stitt didn’t have McCoy and Elvin. Not long after this recording Trane would give up playing on standards entirely. True, the Ballads, and Duke Ellington dates were still two years in the future, but by 1960 Trane’s music was in rapid flux and he would not only pare down his notes per bar, but his chord progressions as well. By the time of My Favorite Things Coltrane had become a musician who could play over the most difficult of harmony at any tempo. Not only did he possess a supreme technical prowess, but he had the ability to infuse his lines with witticism and melody. This is why he sounds so great regardless of whether he is playing a standard or a composition without any harmonic center. Even towards the end of his life, when he would sometimes scream into the horn, there is a foundation. It all comes from substance. In 1960 John Coltrane would begin to eliminate what he felt was not essential. Most of us can only dream of having that luxury and the wherewithal to implement it.